This is going to be a great tasting! $12 with $5 going towards a wine purchase! Setzer Gruner Veltliner – A personal favorite. From the decidedly un-Stelvin screw cap to the odd resemblance to a bottle of posh sparkling water, this wine can’t help but state just how unpretentious it is. It’s the Sprite-iest Gruner I’ve ever had – lemon lime, refreshing, and uncomplicated. Another liter of pure fun at a ridiculous price point! Kruger Rumpf Estate Spatburgunder Rose Trocken – The last vintage turned my head, and the 2017 is screaming right now. Made entirely from Pinot Noir, this is a lean, mean cherry machine. Searing acidity makes it a natural with any kind of food, so it’s very versatile. Prieler Rose vom Stein – While I think the backlash against rose is largely overblown, I will confess to becoming a little tired with the “International Style” seeking to mimic Provencal roses that aim for that unappealing and indistinct middle by trying to be everything to everybody. This is the antidote to that. Made entirely from Blaufranksich from 3 sites in Burgenland, this has an appealing cherry-skin color and a nice bit of weight in the mid-palate. A nice addition to any lineup that needs some variety. Nikolaihof “Zwickl” Gruner Veltliner – Nikolaihof is the oldest certified biodynamic winery in Europe, and possibly the first biodynamic winery in the world. To me, their wines are challenging, with Gruner Veltliners of great texture, weight, and minerality. They’re technically brilliant, without a doubt, but not the most fun to drink absent-mindedly on the couch. The Zwickl, though, certainly delivers the best of both worlds. This is a unfiltered and unfined bottling of their famous entry-level “Hefeabzug” Gruner, and the extra bit of lees left in the bottle lend a much softer texture and fruity roundness to this wine that I find irresistible. Serve it straight up, or shake up the bottle before serving to activate more of that bottle-conditioned aspect! Sattler Zwieglt-Austria’s most widely planted red variety is a cross of two traditional Austrian varieties St.Laurent and Blaufränkisch. The grapes for this wine go through a one to two week fermentation and maceration process and are pressed carefully. The wine matures on the lees for six months and is bottled after minimal filtration. This wine is dense and juicy with a purple color and has hints of strawberries and fresh herbs on the nose. It exhibits ripe fruit on the palate, reminiscent of plum with pleasant acidity and pepper. It is an elegant wine with a spicy balanced finish and an alcohol level of 13,0%. Josef Leitz – Eins Zwei Dry Riesling “3” – 2016-EINS-ZWEI-DRY is the Riesling that provides an entry into the Leitz world of wine. This wine is a cross-section of various Rheingau loess and clay soils with an appealing dry character. The bouquet is characterized by a clear apple fragrance, a hint of kumquat and apricot together with a touch of lime blossom. On the palate the mature fruity acidity emerges, which lends the wine a powerful boldness, allowing it to culminate in a smooth, succulent finale. 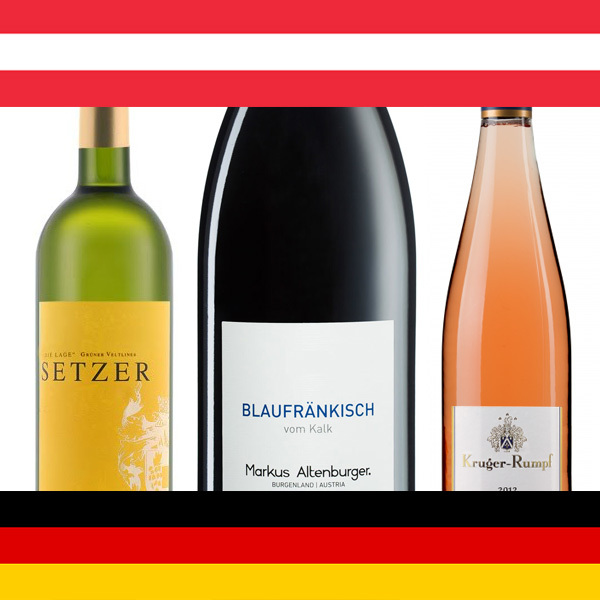 Markus Altenburger – Blaufrankisch “vom Kalk” – 2016- Dark, juicy and plump cherries on the nose carry right through to the palate where they are met with a snappy bright freshness that holds all of this pretty pure fruit in check. This is slightly rustic, even irreverent but it provides freshness, fun and verve. This honest fresh-faced wine will put a spring in your step.